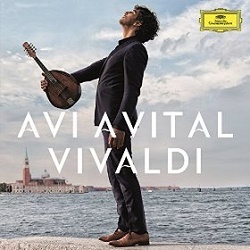 Avi Avital now does for Vivaldi what he did for Bach in 2012 (DG 4790092). We don’t seem to have reviewed that earlier recording of mandolin transcriptions of JSB’s keyboard concertos, but I shall be seeking it out on the strength of its successor. i’d just finished enjoying and reviewing Red Priest’s latest offering, Handel in the Wind (RP012) when I turned to this series of arrangements for mandolin of several Vivaldi concertos, only one of which, RV425, was composed for the instrument. Famous as having been featured in the movie Kramer vs. Kramer it’s the only one he wrote for the instrument, but the other works included here, especially the Lute Concerto, RV93, and the Trio Sonata for violin and lute, RV82, sound very well in Avi Avital’s transcriptions. Even the largo from the Flautino Concerto, RV433, seems comfortably at home on the mandolin, although a plucked instrument doesn’t have the sustained notes of a member of the flute/recorder family. I enjoy the sound of the mandolin, perhaps because there was a group called Troise and his Mandoliers who regularly performed on the steam radio when I was growing up. In fact it appears that they played a collection of banjos as well as mandolins, accompanied by a piano, accordion, percussion and double-bass – picture – and I’d probably hate their massed sound now, but it probably gave me a taste for the members of the lute family. The heading of the notes in the booklet is Rocking Vivaldi, but that’s more a concept than a description of the performances. There’s nothing like the wholesale jazzing up of Bach, Handel and Vivaldi that Red Priest go in for. Certainly the tempi are mostly fast and furious, but that’s not unusual in recordings with the Venice Baroque Orchestra, and apart from the fact that three of the four concertos are transcribed, there’s period practice in play here too. These are bold performances, but the claim that ‘the spirit of rock music is at the heart of [the] approach’ is really a bit of advertising blurb. It’s unnecessary anyway, since the days when prospective purchasers could browse the CD and booklet in a shop are almost gone, though you can peruse the book digitally and sample the recording from Qobuz. I wouldn’t download the recording there, however: at £11.56 it’s more expensive than at least one dealer is currently charging for the CD. You can’t automatically assume that a download is going to be the economical option. If you want one example of Avital’s fast tempi, try the finale of RV93, polished off in 2:03 without a hitch, with a performance from the past by the Paul Kuentz Chamber Orchestra (DG Resonance E4295282), which takes 2:28. The differences actually sound greater than those figures suggest, lively as that was for its day. Actually, it’s the manner of Avital’s performance rather than the speed which gives the impression that he is fast and furious: Julian Bream on an RCA collection of lute concertos by Vivaldi, Handel and Kohaut was only a fraction slower at 2:05 and a recent Naïve recording by Rolf Lislevand and a small ensemble (Concertos for mandolin and lute: V5243, budget price – review of earlier release) is actually a couple of seconds faster than and just as lively as Avital. You will have gathered that I enjoyed hearing this recording but you may well feel that you could have done without yet another version of Summer from The Four Seasons, even with the novelty of the mandolin as the solo instrument. It doesn’t add greatly to the appeal, though DG presumably thought it would be a selling point and it’s powerfully done. Nor does the gondolier song add significantly to the sum of things for me. Bargain lovers should be reminded that Hyperion have a recording of Vivaldi lute and mandolin concertos and trios on their mid-price 30th Anniversary label (CDA30027: Paul O’Dette and the Parley of Instruments – October 2010 Download Roundup). The CD costs around £8.50 and it can be downloaded in mp3 and lossless sound, with pdf booklet, for £6.99 from hyperion-records.co.uk. Sample Avital and O’Dette in the finale of RV93 and there’s very little difference in tempo. O’Dette plays the music straighter but equally enjoyably. A word of warning: by one of those quirks of the recording industry the O’Dette recording also remains on sale at full price on CDA66160, so you need to choose the right version. The download costs the same for both. Whether you choose the older Hyperion recording or the new DG there’s a great deal to enjoy here. Both are very well recorded, though the Hyperion comes with the superior set of notes.